The host An Giang drew two-time champion Hoang An Gia Lai 3–3 in the most exciting match of the national football championship, V-League, yesterday. Nigerian Felix Gbenga Ajala helped An Giang lead from the 19th minute, but his fellow countryman Felix Ogbuke tied the score in the 23rd minute. Tran Minh Vuong netted the ball in the 49th minute to help Gia Lai in the first half time for a 2–1 lead. The naturalised striker Dinh Hoang Max tied the score 11 minutes into the second half time. Red-hot Nigerian striker Timothy Anjembe of Gia Lai made it 3–2 in the 57th minute; however, overseas Vietnamese Mac Hong Quan completed a draw for An Giang with a goal in the 67th minute. The draw pushed the Gia Lai team to the seventh place in the table after 14 matches, while An Giang were still at the bottom. 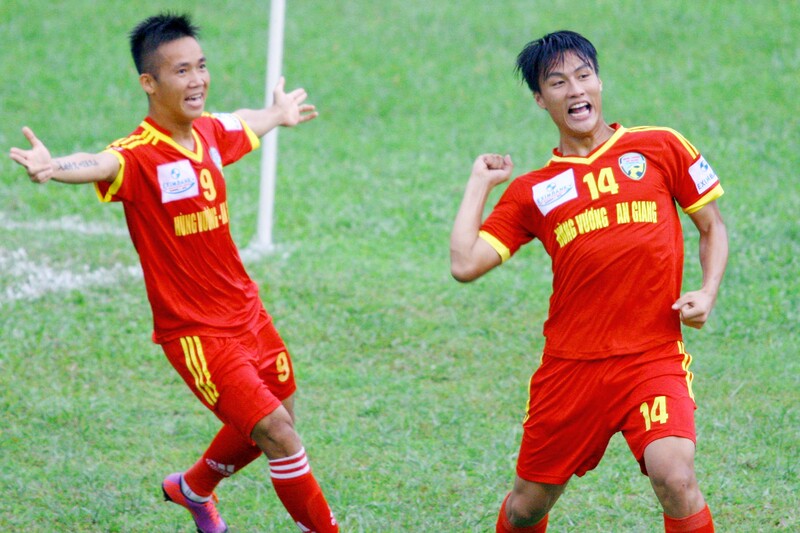 Also played yesterday, Uganda’s Henry Kisekka and Dinh Thanh Trung scored two goals as Quang Nam beat Hai Phong 2–0. The victory pushed Quang Nam to the 9th place with 16 points, replacing Hai Phong in the table. Binh Duong, who did not play yesterday, still lead the championship with 29 points, ahead of Thanh Hoa, Ha Noi T&T and SHB Da Nang. Nigerian striker Ganiyu Bolayi Oseni and Dinh Hiep scored twice to help Dong Tam Long An complete a 2–1 win over Quang Ninh on Saturday. Having failed to net the ball in the first half time, Nigerian Oseni opened the score with a cannon shot in the first minute of the second half time before his teammate Dinh Hiep made it 2–0 in the 57th minute. Nigeria’s Ikechukwu Uche pulled back a goal for Quang Ninh in the 65th minute. Oseni would have scored a second goal in the match if his penalty shot had not hit the back of the net. On Saturday, Phi Son helped the host Song Lam Nghe An lead 1–0 nine minutes into the game against SHB Da Nang, but Argentinean Martin Zbrun of Da Nang drew the match at the 88th minute.